January 10, 2018 – Atlanta, GA – Varec, a petroleum industry innovator and wholly-owned subsidiary of Leidos, a FORTUNE 500® information technology, engineering, and science company, has partnered with Gilbarco Veeder-Root, a technology leader for retail and commercial fueling options, to integrate commercial fleet fuel management systems with bulk fuel management operations. 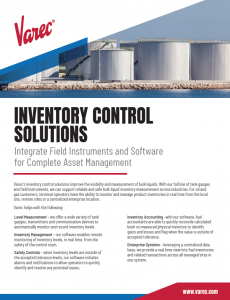 Varec is exclusively offering its FuelsManager technology and Gilbarco Veeder-Root’s Gasboy IslanderPLUSsystem as an integrated solution that will enable fuel suppliers to have complete oversight of assets from the tank farms, terminals and load racks, through commercial fleets at the point of sale. Major oil and gas suppliers and defense agencies across the globe use FuelsManager to provide visibility, inventory management and control of their petroleum assets. IslanderPLUS provides 24/7 terminal systems that support multiple access technologies. Both are compliant with the Department of Defense’s military grade cyber security standards. FuelsManager will interface directly to the Gasboy IslanderPLUS Fleet Management System terminal, to manage the complete fuel sale process. This is done in real-time at unmanned service station facilities and other fuel points. With this integration, fuel suppliers are able to validate authorized users and payment methods before fuel delivery commences. The combined solution will update FuelsManager with completed transaction data for timely and accurate reconciliation. This data can then be integrated at the enterprise to provide suppliers with a complete view of their assets across the fuels supply chain. The integrated solution operates online or offline as it is capable of validating data locally or remotely, enabling real-time validation and data transfer, manual operation or batch transfer of completed transactions. FuelsManager can also manage the Gasboy IslanderPLUS using a variety of wireless methods. 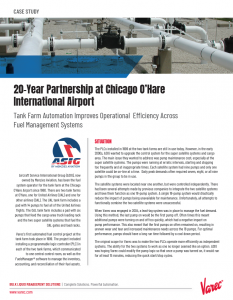 This combined fleet fuels management solution is ideal for state and local agencies, commercial organizations and military operations. For more information, please contact Varec via email at sales@varec.com or by phone at 1-866-698-2732. Gilbarco Veeder-Root is the worldwide technology leader for retail and commercial fueling operations. It offers the broadest range of integrated solutions from the forecourt to the convenience store and head office. For over 150 years, Gilbarco has earned the trust of its customers by providing long-term partnership, uncompromising support and proven reliability. 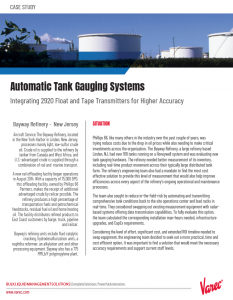 Major product lines include: fuel dispensers, dispenser media, point-of-sale systems, payment systems, tank gauges, software development and integration, fleet management systems and nozzles. For more information, visit www.gilbarco.com and www.gasboy.com.